I recently made my wife a gift using a couple of silk neckties, wooden dowels and plumbing hardware obtained from the local hardware store. The resulting necklace was a mere prototype, yet my wife has worn it more than three times, without my goading --which I'm told is a true sign that a gift is appreciated. 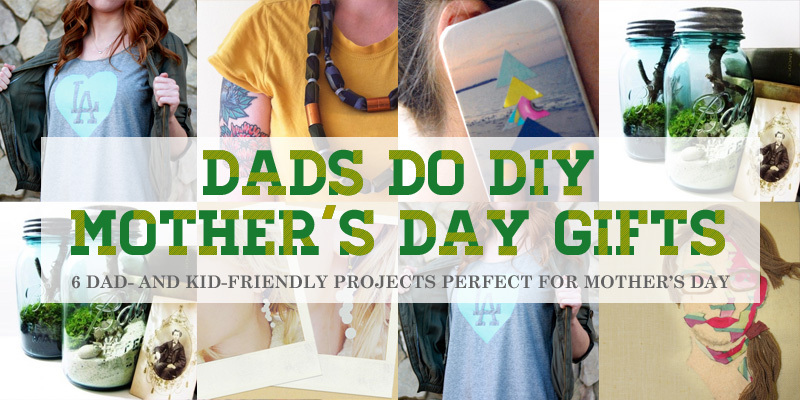 After the jump there's a set of kid-friendly instructions for how to make the necktie necklace, as well as five more spectacular DIY gifts that dads and kids can make as a sweet and sentimental offering for mom on Mother's Day. TIME: A few hours to 2 days depending on your skill set. FOR THE KIDS: Stuffing and threading the necklace is a great activity for little fingers. It’s a great small motor exercise, and it’s loads of fun watching everything come together. TIP: I found that the most difficult part of the project was resewing the neckties into a silken tube. In fact I had to outsource this portion to a neighborhood clothing designer who then was put in a spot when my wife visited the boutique to shop. TIME: Minutes to a few hours if you have really young kids helping. FOR THE KIDS: Punching the holes? Gluing the dots? This is a busywork project that couldn’t be more perfect for the preschool set. TIME: With kids, this project might take an entire day to complete. FOR THE KIDS: They get to decide what stencil sends the right message and which color mom would like best. Plus, permanently making a mark on fabric is every kids’ dream. TIP: If you’re working with kids under 6 years old, it might be best to go for a more abstract image using paint tape to create a negative image stencil. TIME: This shouldn’t take more than a few minutes if the kids are being cooperative. FOR THE KIDS: Step away from the work area giving the kids the room to truly get creative. TIP: Pre-cut the collage elements for kids under 12 or simply give the kids a hole punch and a bunch of colorful magazine pages. The smaller and less busy each collage element is, the better they will look when combined as a full piece. The herbs sitting in the jar are just bursting with aroma, waiting for mom to pop the lid and take a whiff. FOR THE KIDS: They get to play in dirt, creating a miniature ecosystem that they can watch germinate and grow. TIPS: Keep the jar right-side-up, as you want mom to be able to open the lid. Also: It may sound like a silly note, but be sure to choose herbs that don’t trigger an allergic reaction for mom (and not everyone likes the smell of lavender). TIME: Being a two-part project with a bit of trial and error by the kids, I’d suggest spreading it over two days. FOR THE KIDS: An important exercise for any child is the self portrait. This project sees kids creating a drawing of their favorite person (themselves) while dad reinterprets their creation with a new medium. TIP: Kids should help select which block of color goes where in the collage. Instructions for how to make a necktie necklace. FOR THE KIDS: Stuffing and threading the necklace is a great activity for little fingers. It's a great small motor exercise, and it's loads of fun watching everything come together. FOR THE KIDS: Punching the holes? Gluing the dots? This is a busywork project that couldn't be more perfect for the preschool set. TIP: "Using just tiny dabs of hot glue, start arranging and gluing your dots together in a random, but linear fashion. You want them to look like they are falling." Instructions via Evie S.
FOR THE KIDS: They get to decide what stencil sends the right message and which color mom would like best. Plus, permanently making a mark on fabric is every kids' dream. TIP: If you're working with kids under 6 years old, it might be best to go for a more abstract image using paint tape to create a negative image stencil. TIME: This shouldn't take more than a few minutes if the kids are being cooperative. 5. AROMATHERAPY HERBERRARIUM The herbs sitting in the jar are just bursting with aroma, waiting for mom to pop the lid and take a whiff. TIME: Being a two-part project with a bit of trial and error by the kids, I'd suggest spreading it over two days.